The blurb refers to the commentary that appears on the dust jacket flaps or the rear of the dustjacket. In the case of a paperback, this might appear on the rear cover of the book. Although it is less common in modern books, previously publishers have also used the front of the book or jacket for blurbs. Often a blurb contains a mixture of plot synopsis and promotional pitch from the publisher, and a small section about the author (perhaps with a photo). Sometimes the blurb might contain snippets of reviews from external media or other authors. 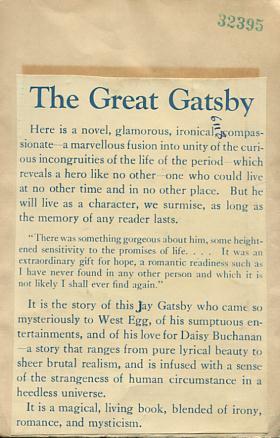 Below is an image of a jacket blurb, unfortunately excised by a library from a... wait for it... a first edition of the Great Gatsby (not the one linked to, thankfully)!